Everything changes as soon as baby comes into your life. No matter how many books you have read – a child will teach you much more than all of those together. Even though you may sometimes feel that you’ll fall apart, parenthood is definitely one of the greatest things in the world. If you are a novice, we are sure that you will need some tips on how to deal with certain situations. Here are five important life hacks for all the new parents out there. Finding out if your baby is wet or poopy has never been easier! Diaper line will help you check that out without even having to open the diaper. Most of the brands have it nowadays, and all you have to know is that the yellow line turns blue as soon as your little fellow wets himself. The line will even change its shade into a darker blue one if you let it sit a little longer. Warming up the bath towel with a heating pad is definitely a life saver, especially for parents with newborns. That will help your baby ease the after-bath screams. Besides that, heating pads are also very useful for warming a crib mattress in the process of transition from sleeping in your arms to sleeping in the crib. Just make sure that the heating pad is removed from it as soon as you put your baby to sleep. Laundry detergents are often not enough, especially when it comes to the nastiest stains on your baby’s clothes. This is exactly why you should make your own “magic laundry cleaner”, with the items you already have in your household. Mix one cup of hydrogen peroxide with ½ cup of the dish soap and ½ cup of baking soda. The mixture will start to bubble up from the peroxide, whereas the baking soda will make it thick. Apply the mixture and use a brush to scrub the remover into the stain. Let it sit for one hour, and then wash the clothes regularly. You will see that this combination does wonders! 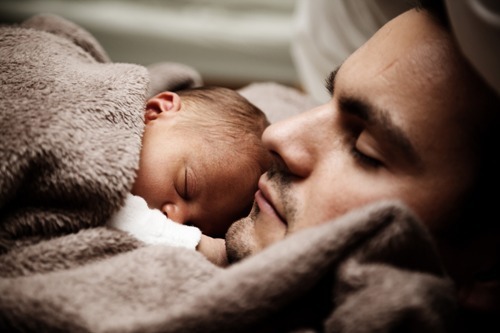 A lot of parents use cameras to supervise their children while they are sleeping, which is particularly convenient for the newborns. On the other hand, slightly older children should be looked after all day long, especially when it comes to playtime. Young parents are often busy with their jobs and other everyday activities, and only one second is enough for a child to get harmed during play. This is exactly why the right solution is to set a game camera into the room where the child spends most of his or her time. That will help parents check on their youngest ones in the best possible way. If you baby has very dry skin, the first thing to do is to buy a baby lotion, right? Well, this is not the smartest solution, simply because many of these have a label that says something like “if swallowed, get medical help”. Really? The first thing babies do is sticking their tiny hands into the mouth, which is why this may be potentially dangerous choice. Instead of baby lotion, you can use organic coconut oil that is healthier and much gentler to your baby’s skin, plus the fact that it smells great. As you can see, there are so many things that perhaps would never come across your mind. But don’t worry – having a child means that you will have to learn one step at a time. Just have in mind the aforementioned hacks and that will make your life at least slightly easier. I have been there, nothing can really prepare us for parenthood. We have to learn it practical hands on day to day experience.